If you are a blogger you’ve probably heard about CoSchedule and if you’re anything like me you’ve wondered if it’s worth it. I know when I first heard about CoSchedule, I had no desire to try it. Why should I pay money for a calendar when there are 100’s of free calendars available online. Then, my curiosity got the best of me and I decided to give it a try. CoSchedule offers a free trial which is awesome for really giving it a fair chance before you make a commitment. By the way the free trial doesn’t require a credit card! Before I get into my thoughts of this program let’s go over some features of CoSchedule. Ability to assign tasks to team members. You can schedule your Google+, Facebook and Twitter updates without leaving your blog! You can reschedule old blog content. The plugin is lightweight and doesn’t take up a lot of your WordPress resources. Sounds cool, right? So how much does this cost? CoSchedule is $10 a month. I’ve been trying CoSchedule out under their free trial and I have to say I’m really impressed. It was so easy for me to go in and plan out all my blog posts for the next few weeks. When I log into my blog and look at my calendar I love the clean feel of it. I’m able to quickly see what is scheduled to post that day, what I need to work on for the upcoming week and I can even see what social media updates will be going out. At this time I don’t have a team of writers but if I did I’d be able to assign each team member tasks! This is a huge bonus for larger blogs. No more emailing back and forth and hoping they remember the tasks you assigned. You can now do it right from your WordPress dashboard. Ready to see CoSchedule in action? 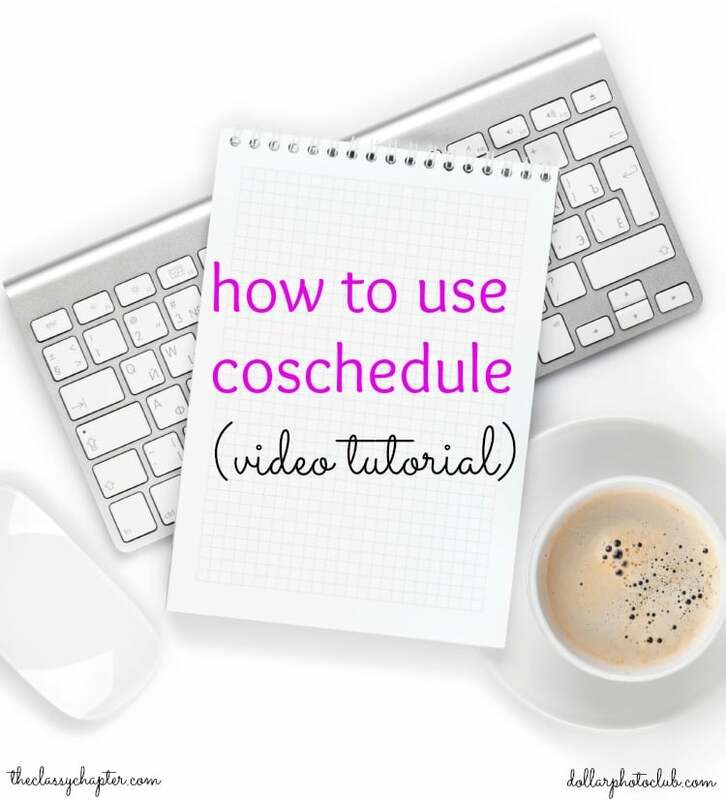 Check out this quick video tutorial I created to show you exactly how CoSchedule works! I can tell you without a doubt, I will be keeping CoSchedule! I love how easy it makes my blogging life. If you enjoyed this tutorial make sure to share it with your blogging friends! I am on Blogger, but this sounds really neat! I just use my handy dandy planner. 🙂 This does seem like it would make life much less complicated. I do love this. Your tutorial is super easy to understand. I think once I start to consistently monetize, this might be something for me to consider. Great tutorial! I just signed up as a blogger and if you write a post you get a discount for your first year! I’m still on the fence because right now I just don’t have it in my budget after putting all my money into my updating my website and upcoming conferences. But who knows, I might change my mind. I’ve visited the though of using Co-Schedule and think it just pay be worth my time and investment. The social media and posting aspects are just consuming too much time. I started a co-schedule free trial last week, and I am in love! I love the easy drop and drag calendar. I’m definitely paying for it when the trial is up. I’ve found in just a week’s time, I can’t live without it, lol! I don’t use WordPress, and CoSchedule is one of the few things that makes me VERY jealous of y’all! Skye recently posted…Our Favorite Silly Children’s Picture Books! I actually haven’t heard of coschedule until right now! It’s def something I’m going to have to look into as I try to figure out this big world of blogging! I’ve been up in the air to try coschedule, but it looks super helpful thanks for the tips! I was up in the air about it as well. I finally took the plunge and I love it! Wow! Thanks for writing this awesome review. We loved your tutorial video! Thank you, Nicole! CoSchedule is awesome! I have been using CoScheduler for a few months and have been happy with it – I am sure you will love it! great tutorial! I’ve been rolling the idea of starting with co-schedule for awhile now. I also love the super clean look of it. Thanks for sharing! Thank you so much for this video review. I loved being able to see how it actually works on the back end and I’m totally trying out the free trail. Thanks again! You are very welcome! So far, I’m still loving it. Hi. I’ve been using co-schedule, too. I’m not sure what I think. It’s easy to use but I find scheduling with FB hasn’t been great. (I think the third party schedule makes my reach a lot less.) Have you experienced this? I only use it to schedule my Twitter. I do believe that scheduling via a third party application limits your reach. 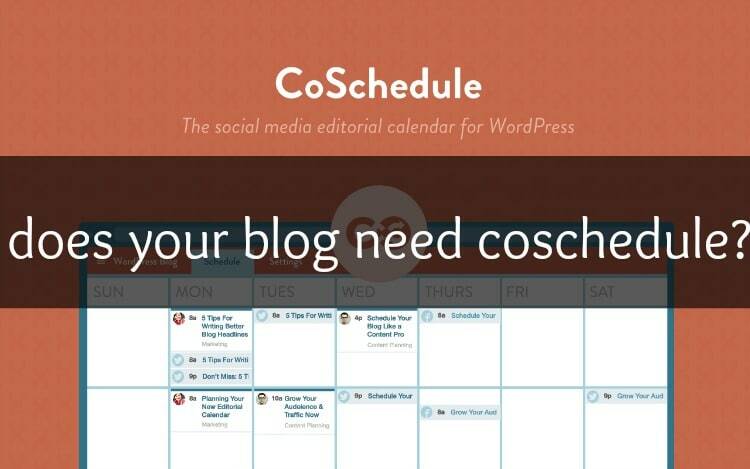 I wish CoSchedule worked on Blogger as well!